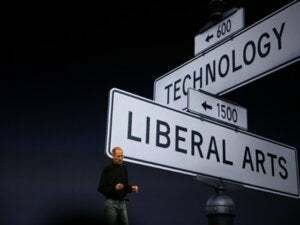 New York City, July 19-- During his usually sedate keynote speech at Macworld Expo in New York City, Apple CEO Steven P. Jobs announced that Disney and Apple would merge, effective immediately. Pixar will be acquired by the newly-formed holding company, Apple Core, which will continue to operate Disney and Apple as wholly-owned subsidiaries. Asked if he was worried about rekindling the old lawsuit with the Beatles' Apple Corps, Mr. Jobs responded, "You mean our new subsidiary? Why don't you ask my new CFO, Ringo Starr?" Starr added that the merger was more than a marriage of financial opportunity. He said Disney would benefit from the same vision and product development acumen Jobs, whose title will now be überCEO of Apple Core, or üCEO for short, used to turn around Apple's fortunes. As an example, Starr pointed to plans to redesign Disneyland, a theme park in Anaheim, California that he noted had remained largely unchanged since it first opened in the '50s. "And people complain because the Mac OS is 17 years old!" Pirates of Silicon Valley. Forget about the Caribbean--these pirates storm the boardrooms of unprepared companies throughout the tech sector. Of course, in the end, drunk with privilege and inflated stock options, these pirates get their comeuppance! Captain Ego. A state of the art 3-D laser light show starring the üCEO himself on a fanciful adventure to bring translucent colorful plastics to a universe filled with dull, beige products. It's a Mall World After All. A charming ride where children of many nations sing the praises of eCommerce as a source of ultimate equal opportunity. After all, on the Internet, no one cares what your ethnicity is, as long as your credit card is paid up. Mr. Bill's Wild Ride. A fast-paced trip through a Justice Department Anti-Trust investigation. At the end of the ride, each car is cut in two by a giant buzz saw. The Hall of Exploited Cultural Icons. Five heroes from the Think Different campaign, brought to life in full animatronic splendor, talk to visitors about how they would have used a Mac, if only personal computers hadn't been invented decades after their deaths. Great Moments with Mr. Wozniak. This attraction, currently featuring an animatronic Abraham Lincoln, will now star Steve Wozniak. The real one. Starr said that sometime toward the end of 2002 DisneyLand G2 would also open an entirely new section of the theme park, called iLand. the Apple Core CFO declined to give specifics on the attractions in iLand, except to say they would all begin with a lowercase "i". For his keynote finale, Jobs unveiled a working prototype of the New Mickey Mouse, now round, translucent and only useable by five year-olds. "Brilliant, just brilliant," said Brian Drain, senior technology analyst at Sycophantic Information Corporation. "And the new mouse -- I mean, wow! Weren't you getting tired of that same old rodent in black and white? He hasn't changed since the twenties! Andrew Gore and several unindicted co-conspirators contributed to this report.